This guide will give you lots of practical advice to make moving home with a cat easier for you, your family and your favourite feline. It’s not just about cats moving house either, it’s about getting them to their new home safely, settling in and what happens afterwards. So we’ll be showing you how to familiarise your cat with your new home and stop it going back to your old house too. Moving house with cats isn’t rocket science, but it can add to the stress of moving home if you don’t plan ahead and prepare your cat for what to him or her might be unexpected if not scary. 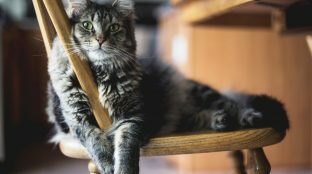 Cats are territorial and come moving day will probably still be as attached to their home as you once were, but by following a few simple steps you can make the move more enjoyable. Each stage is important and needs careful consideration and preparation; skip a stage and you might end up with a miserable or missing moggy, but plan it properly and everyone’s in for an easier ride. Like any territorial creature, cats enjoy spending time in a familiar environment, and any sudden change to their surroundings or being moved away from it – even temporarily – can upset them. This is why maintaining a sense of familiarity and safety is key. Make sure kitty is micro-chipped too and tell the microchipping company your new address so they don’t think your cat’s run away. It’s the safest way to ensure they can be found if they do escape or try to return to their old territory. Choose a “safe room” in your current house. This is where your cat can spend its time while the movers are packing and loading the lorry. Put some of your cat’s favourite things inside this room: blankets, bedding, furniture, toys or other items you know it likes to have nearby. Keep this room closed on moving day so your cat can’t escape or be spooked by seeing unfamiliar people coming and going. If you have a dog too, it might be best to keep them in different rooms depending on how well they get along. Tell your movers about the safe room and to leave it ‘til last. Pop in occasionally to give your cat some reassurance and TLC. When all the other rooms are packed and loaded, close your front door. 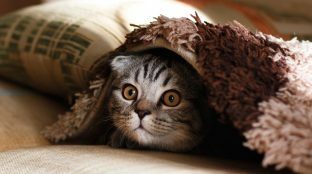 If your cat has become nervous then it might try to escape the moment you open the safe room door. If all is well, secure your cat inside their carrier and pack the contents of the safe room. Cats love familiarity, so adding their scent to their new home can help them feel more secure in it. Blue Cross, the veterinary charity recommends rubbing your cat’s face, neck and body with a soft cotton cloth. Then rub the cloth on walls, doors and furniture at cat height. Repeat this daily and your cat will feel more familiar with your new home and help them settle in quickly and easily. The RSPCA also has some very useful tips and advice for creating the right kind of environment for your cat. Keep your cat indoors for the first two weeks. 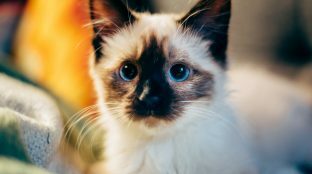 It can take several weeks for your cat to become familiar with, and feel secure in, your new home; they’re most likely to escape if let out in the first couple of weeks. Tap your cat’s food bowl and call it inside for feeding. Do this every day, extending the amount of time your cat explores before feeding them. If you’re worried your cat will try to leap over the fence, use a harness and lead. Before you know it, your cat will feel safe and secure in its new home and garden. It’s well worth leaving a picture of your cat and your contact details with the people moving into your old home too. If your cat does escape and return there, they’ll be able to let you know but tell them not to feed it, or do anything which might encourage it to spend any more time there.